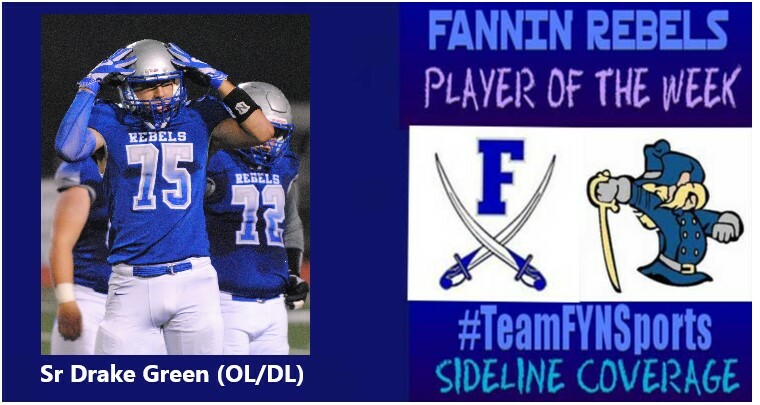 Although Drake Green isn’t listed on the Fannin Rebels’ MaxPreps roster, this senior lineman is certainly one who isn’t overlooked on the field. Green has protected the pocket from the edge of the offensive line all season long, and on the defensive side of the ball his height has offered an advantage to disrupt opponents’ passing attacks. Green played possibly his best game of the season Friday night when the Rebels hosted the East Hall Vikings and Fannin County High School. Congratulations to senior Drake Green, best wishes for the rest of your senior school year. At TeamFYNSports, we try to spread the love around when selecting out Sportswriter Player of the Week. On rare occasion, however, one athlete stands out so well we simply can’t help but give it to him more than once. 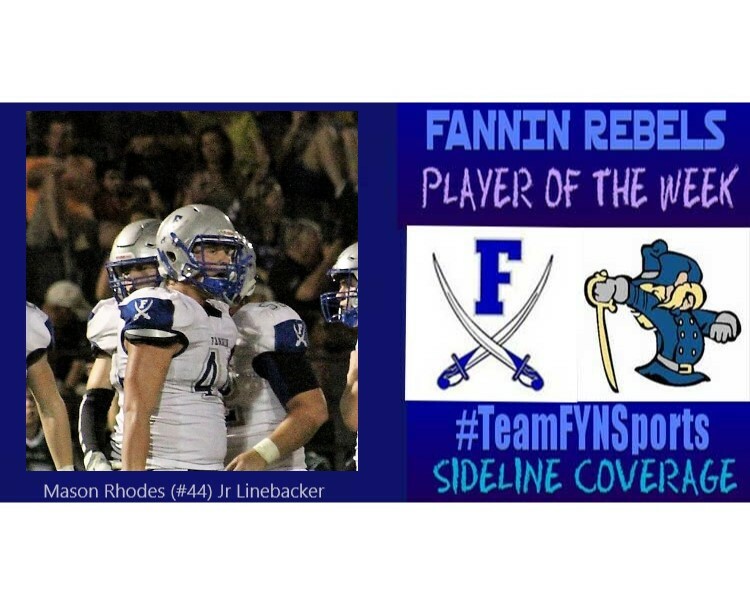 Fannin Rebels inside linebacker Mason Rhodes, who racked up 17 tackles and a sack against Andrews, NC to earn POTW honors, went even further this past Friday night at North Hall. Rhodes was the most aggressive player on the defensive side of the football, recording 18 tackles and 2 sacks on the road against an even better opponent in the Trojans. Leading by example, his hustle sparked the defense on several different plays. Congratulations Rhodes and good luck this week against G.A.C. We look forward to your performance. Two weeks ago, the Union County Panthers were undefeated and hosted Greater Atlanta Christian with hopes of establishing themselves as the team-to-beat in the region. Four quarters and a few rolls of athletic tape later, it was the Spartans of GAC who emerged victorious with a 47-7 final score. 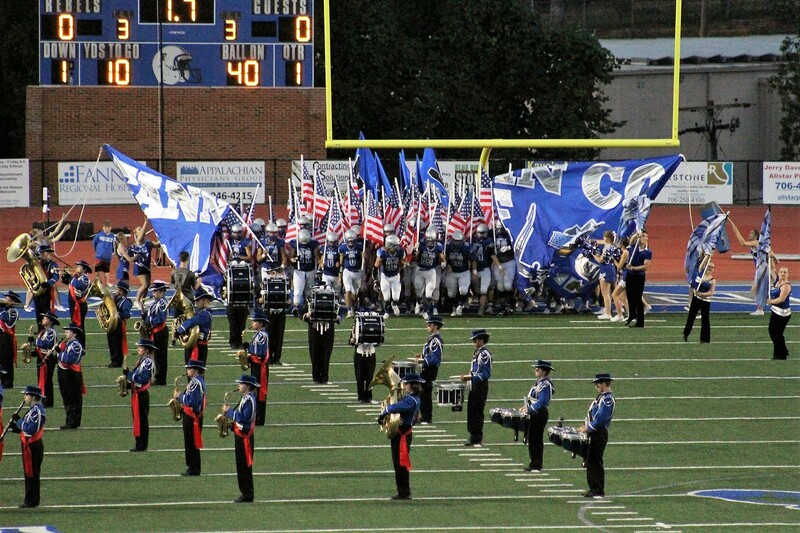 The Spartans returned to the mountain area for the second straight week, this time to face the Fannin County Rebels. Although the Rebels would not win the game on the scoreboard, they managed to garner national attention by doing something even more impressive than a hail mary touchdown pass or a long, game-winning field goal. Senior linebacker Austin Brown (82) stretches out and attempts to tackle a GAC Spartan ball carrier in Friday night’s 55-7 loss at FCHS. The Rebels took the field carrying 40 American Flags, waving them in front of a packed stadium where there wasn’t a single person in his or her seat. The energy inside the stadium was so electrifying you could feel the hair standing up on the back of your neck and they only thing louder than the cheers from the proud spectators was your own heartbeat, racing to the beat of the Fannin County High School band’s percussion. Photos and video of the event soon went viral, and rather than talk about how the game ended; everyone has been talking about how it began. The excitement dissipated shortly after kickoff, as GAC put up 28 unanswered points in the first quarter and another 20 before the half. With a 48-0 score going into the locker room, the Spartans had pretty much shown everyone why they’re considered the best high school football team in the state. Refusing to quit, however, Fannin came back out onto the field and played as hard as they had the entire game, eventually finding paydirt near the end of the 3rd quarter. GAC scored a touchdown as well, but with a running clock the game came to an end and attention could once again return to the display of unity by the Rebels when they first took the field. ****Offensive stats were not available at the time of publishing. The Rebels enjoy a bye week this week while the Spartans host East Hall in what should be the best match-up in the region. East Hall is coming off a 62-42 win over Union County last week. 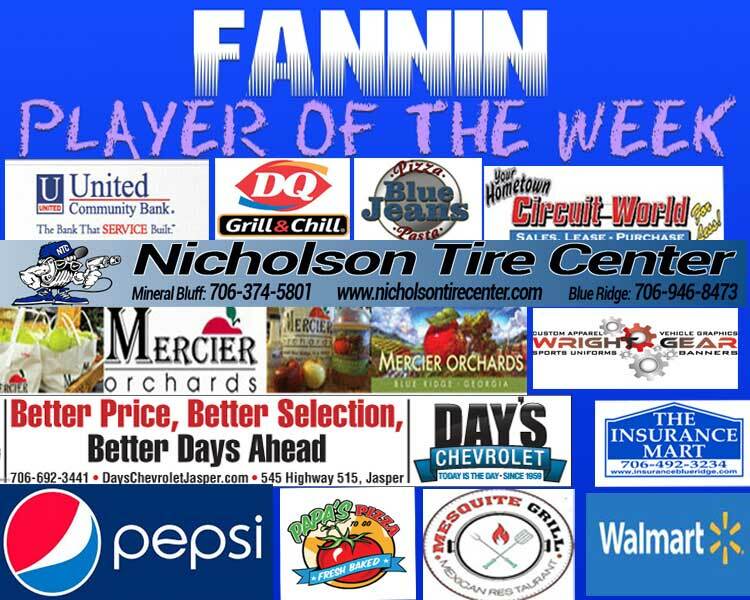 Fannin returns to the road next week as they travel with intent to upset Dawson County, who hosts Union this week. 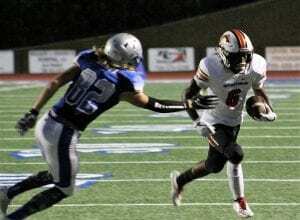 The Tigers defeated North Hall last week by a score of 30-7. This week the Fannin County Rebels hosted AAA-Region 7 frontrunner Greater Atlanta Christian High School (Gwinnett), a contest that revealed the true character of the home team as Fannin found themselves down-and-out prior to the second half of play. Under the direction of the Fannin County’s coaches, the team pulled together and showed that they refused to give up until the game was officially over. Choosing the Sportswriter Player of the Week is a difficult task when the entire team shows relentless pursuit defensively and an unwavering attitude of persistence on offense. 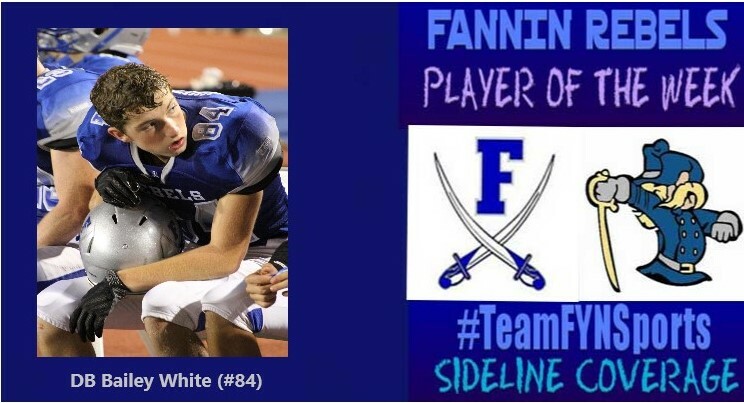 Both on the field and on the sidelines, defensive back Bailey White showed the most guts this week (literally), earning POTW honors for the first time with TeamFYNSports. White played all four quarters of the game without complaint and without hesitation, despite battling flu symptoms. A vital part of the Rebels’ defensive scheme as well as special teams, White recognized that his position was one that could not easily be replaced. He recorded five tackles in the 55-0 loss, and he broke up a pass that would’ve surely resulted in another touchdown for GAC. Congratulations Bailey White and we wish you to get well soon.